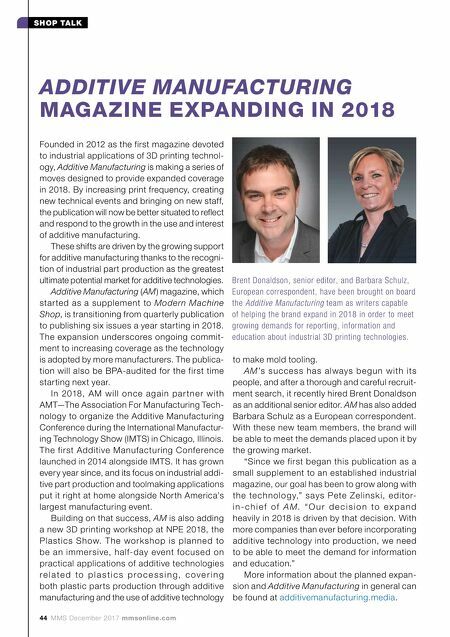 44 MMS December 2017 mmsonline.com SHOP TALK Founded in 2012 as the first magazine devoted to industrial applications of 3D printing technol- ogy, Additive Manufacturing is making a series of moves designed to provide expanded coverage in 2018. By increasing print frequency, creating new technical events and bringing on new staff, the publication will now be better situated to reflect and respond to the growth in the use and interest of additive manufacturing. These shifts are driven by the growing support for additive manufacturing thanks to the recogni- tion of industrial part production as the greatest ultimate potential market for additive technologies. Additive Manufacturing (AM) magazine, which star ted as a supplement to Modern Machine Shop, is transitioning from quarterly publication to publishing six issues a year starting in 2018. The expansion underscores ongoing commit- ment to increasing coverage as the technology is adopted by more manufacturers. The publica- tion will also be BPA-audited for the first time starting next year. In 2018, A M w ill o n c e ag a i n pa r tn e r w i th AMT—The Association For Manufacturing Tech- nology to organize the Additive Manufacturing Conference during the International Manufactur- ing Technology Show (IMTS) in Chicago, Illinois. The first Additive Manufacturing Conference launched in 2014 alongside IMTS. It has grown every year since, and its focus on industrial addi- tive part production and toolmaking applications put it right at home alongside North America's largest manufacturing event. Building on that success, AM is also adding a new 3D printing workshop at NPE 2018, the Pl a stic s S how. T h e wo r ks ho p is p l a n n e d to be an immersive, half-day event focused on practical applications of additive technologies r e l a t e d t o p l a s t i c s p r o c e s s i n g , c o v e r i n g both plastic parts production through additive manufacturing and the use of additive technology ADDITIVE MANUFACTURING MAGAZINE EXPANDING IN 2018 Brent Donaldson, senior editor, and Barbara Schulz, European correspondent, have been brought on board the Additive Manufacturing team as writers capable of helping the brand expand in 2018 in order to meet growing demands for reporting, information and education about industrial 3D printing technologies. 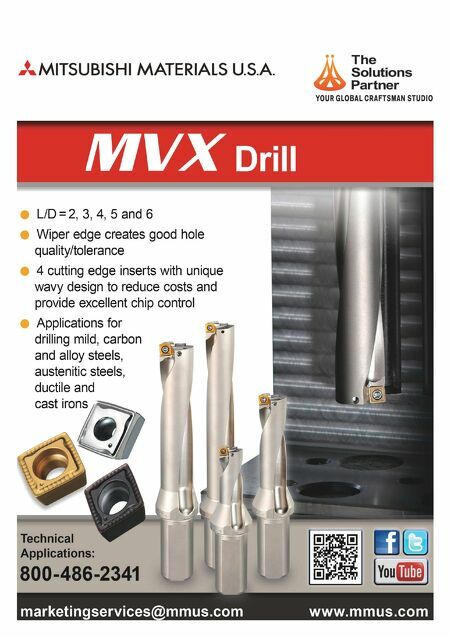 to make mold tooling. AM 's su c c e s s h a s a l ways b e g u n w i th i ts people, and after a thorough and careful recruit- ment search, it recently hired Brent Donaldson as an additional senior editor. AM has also added Barbara Schulz as a European correspondent. With these new team members, the brand will be able to meet the demands placed upon it by the growing market. "Since we first began this publication as a small supplement to an established industrial magazine, our goal has been to grow along with th e te c h n o l o g y," s ays Pete Ze l i n s k i, e d i to r- i n - c h i e f o f A M. " O u r d e c i s i o n t o e x p a n d heavily in 2018 is driven by that decision. With more companies than ever before incorporating additive technology into production, we need to be able to meet the demand for information and education." More information about the planned expan- sion and Additive Manufacturing in general can be found at additivemanufacturing.media .